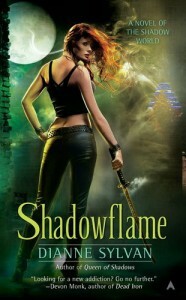 While the majority of reviews for "Shadowflame" are less than favorable, I have to say I was pleasantly surprised by this book. I don't really like how Miranda's character has evolved, but the plot and the rest of the characters were compelling enough for me to want to keep reading the series. A lot of people seemed to be upset at David and Deven, and how Miranda stays with him, but I think that shows how Miranda is accepting her new roll as the Queen; if she ends the relationship with David, they both die and the Southern US Territory will be thrown into chaos. I really enjoyed learning more about Deven and Jonathan, and I'm very happy that Cora might get a happily ever after.